Ajman, UAE: A Memorandum of Understanding (MOU) to promote tourism growth in the emirate and enhance business opportunities was signed between the Ajman Tourism Development Department (ATDD) and Gulf Chinese Trading Corporation. HE Faisal Al Nuaimi, General Manager of ATDD and Mr Feng Luo, General Manager of Gulf Chinese Trading Corporation, operator of Ajman China Mall signed the agreement this week during the “Hunan Manufacturing Industry Steps in Middle East The Park District of Economic and Trade Cooperation Conference” held at Fairmont Ajman. According to the MOU, both parties will share the goal of promoting tourism growth in the emirate by attracting more investors. They will form the framework and basis of cooperation and joint efforts to make its activities effective and beneficial. This includes initiating programs and activities that support tourism and similar matters that will promote Ajman as tourism destination on local, regional and international levels. 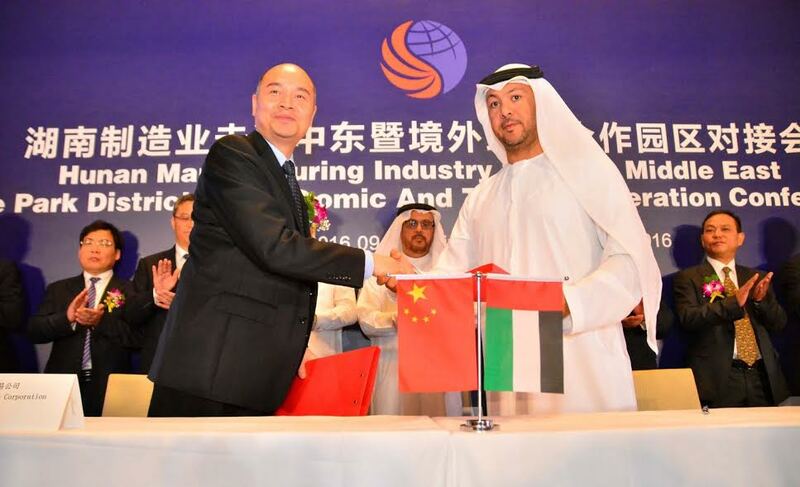 More than 250 delegates composed of businessmen and investors from the Hunan Province of the People’s Republic of China attended the conference organised under the patronage of HE Abdullah Mohammed Al Muwajai, Chairman of Ajman Chamber of Commerce & Industry and the Administrative Committee of Changsha Hi-Tech Industrial Development Zone. ATDD was a strategic partner of the conference. The ATDD, Ajman Chamber of Commerce, Ajman Free Zone Authority, Ajman Department of Economic Development, Ajman International Airport and Economic Logistics City and Al Zorah Real Estate highlighted the stable economy of Ajman, its safe environment, geographic location and the different opportunities available to companies. The delegates from Hunan Province of China represented by Gulf Chinese Trading Corporation, Zoomlion Heavy Industry Science & Technology Co., Ltd., Bank of China and the Industrial and Commercial Bank of China also presented what they can offer to the emirate in terms of potential business. Both governments express their intention to solidify and deepen the relations in terms of more cooperation in trade, investment, industrial, infrastructure, banks, insurance and other economic development. The MOU also cited that the parties shall activate their networks to support their activities, to promote new practices in Ajman and the area in general as per the approved activities and to exchange corporate knowledge, experience and expertise on all common levels, to exchange information and studies that relate to each party’s field of work. Ajman Tourism Development Department (ATDD) was established by His Highness Sheikh Humaid Bin Rashed Al-Nuaimi, Member of the Supreme Council and Ruler of Ajman.